The PowerLite 570 ultra-short-throw projector brings a new level of collaborative learning to the BYOD classroom. With brilliant image quality, plus advanced network connectivity, this wireless XGA performer makes it easier than ever to share engaging lessons and interact with every student. 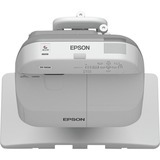 Offering 3x Brighter Colors than competitive models, Epson 3LCD projectors ensure bright, vivid lessons. Featuring 2700 lumens of color brightness and 2700 lumens of white brightness, the PowerLite 570 delivers dynamic images that are sure to captivate any classroom. It can project a 93" image from just 12" away. And, it features Moderator software, so you can easily share students' work from multiple devices, simultaneously. Diagonal Image Size 55.9" to 93.2"